Istanbul, Ankara, Mersin and Kayseri among others are some of the major cities fueling the demand for personal protective equipment in Turkey. EU Workplace Health and Safety Directive acts as Turkish Health and Safety Legislation. The effect of these regulations is expected to be high in the coming years boosting the demand for personal protective equipment. Increasing awareness about workplace safety and strict government mandates is fueling the demand for personal protective equipment in Turkey. Apart from this, increasing number of workplace accidents is also boosting the demand for personal protective equipment. The OHS law governs occupational safety and health in Turkey. Low quality and inexpensive products coupled with rising popularity of automation across different industries are some of the key restraining factor for the market. However, in the coming years, these safety mandates are expected to be more strict making it compulsory for business utilities to follow safety regulations. 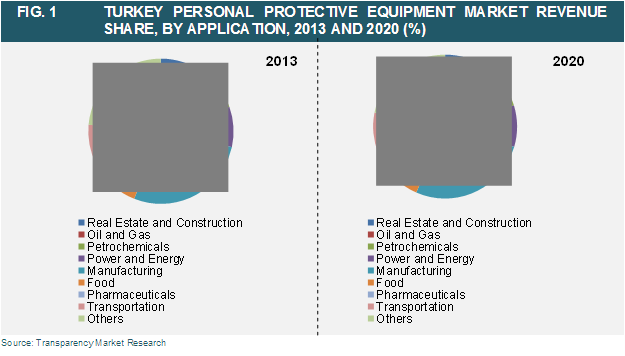 This market research study analyzes the personal protective equipment market in Turkey and provides estimates in terms of revenue (USD million) and in terms of volume (million units) from 2014 to 2020. In addition, it also provides average selling price (ASP) of personal protective equipment in Istanbul and rest of Turkey across types and application segments. It recognizes the drivers and restraints affecting the industry and analyzes their impact over the forecast period. Moreover, it identifies the significant opportunities for market growth in the next few years. The report also analyzes macro economic factors influencing and inhibiting the growth of personal protective equipment market in Turkey. Porter’s five forces analysis offers insights on market competition throughout its value chain. In addition, the market attractiveness analysis provided in the report highlights key investing areas in this industry. The report will help manufacturers, suppliers and distributors to understand the present and future trends in this market and formulate their strategies accordingly.